THE WAVE IN SANDY HOOK! MORE PERSONAL ACCOUNTS FROM THE WAVE! FOUR WEEKS LEFT AND THE WAVE IS EVERYWHERE! IT'S THE END OF THE WORLD AS WE KNOW IT... AND YOU SHOULD FEEL FINE! Focused on by so many for so long, the day has finally come, arriving with the sun moving into its lowest position in our region at 6:12 AM this morning. So, how are you doing? How are you enjoying the end of the world, which some believed was the predictive significance of the Mayan Calendar supposedly ending on this date? Worried? Excited? Not impressed one way or another? Well, of course, the world, as in Planet Earth, isn't ending today nor in any foreseeable future, but... the world as we know it is definitely ending, or more accurately... shifting. It has been for a while. I've called the energy of this shift "The Wave," and it has definitely been effecting people's lives at an accelerated rate as we've come down to the end of 2012. Anxiety, depression, frustration, along with deaths, disasters, tragedies and relationship turmoil... this time of year has always been the "high season" in the therapy business, but this year, it's been off the charts. Likewise, people are feeling a sense of excitement, promise, expansion and an inner peacefulness in increasing doses as well. That, too, is part of The Wave. Collectively, there is a great acceleration going on as well. The superstorms before election day in November seemed to almost deliberately help Barack Obama get re-elected, while the tragedy in Connecticut this past week seems to be waking up the country to the retrogressive 3D beliefs that needed to be jettisoned quickly as we head into 4-and-5D. I watched in awe on TV this week as people literally handed in their guns by the thousands and politicians of both parties were acknowledging the need for more serious gun control and more serious attention to the mental health needs of our population. But the end of the world as we know it is even bigger, much bigger, than changing laws and policies, bigger even than changing people's minds and attitudes on certain social and interpersonal issues, bigger than tidal waves, hurricanes and earthquakes, which have also been on the rise. - Creating our reality consciously, and without the constraints of linear time, will be accepted as commonplace. Being able to get from A to Z without having to go through the whole alphabet, getting from here to there without all of the stop signs, detours and switchbacks in between will be easily accomplished. - Notions like "serendipity" and "coincidence" will seem like old superstitious ways of thinking, as those concepts and what we once thought of as "miracles" will now merely be understood as the result of nature unimpeded. - Healing of illness and injury will become more spontaneous and organic, effected through directing consciousness and the forces of nature, rather than by relying on the invasive slash, burn and drug technologies of 3D. - The future and the past will be understood as creations in the present, and as such, ruminating about the past and worrying about the future will dissipate in our emotional states. - Death will become clearly understood as an archaic illusion of the 3D linear game of limitation, and ultimately, death itself will simply become obsolete as an experience. - Abundance will be a given. We will no longer live in a consciousness of "need" and "greed," two sides of the same Oral Character Structure coin. While money may still continue to exist for a while as a means of exchange, it will become perfectly clear that material abundance and abundance in all areas is our birthright and merely the nature of existence. Perhaps in another conversation, we can address the notion of there being many Earths with many versions of ourselves living on them, but let us at least say this, that not everyone you know, and not everything you "have" in your current life on your current Earth will be with you much longer. Some will, or already have, left the planet, and some will dig into their 3D attachments, even as the tide of 4D makes their lives more and more difficult. And while it may still seem to you that there is a continuity to the changes in your life - from people leaving your sphere because they have died or moved locales or broken off ties with you, etc. - as we continue this acceleration, you will experience certain disappearances and appearances happening more rapidly and suddenly, without the typical transitions (Read the FPl post: "WHATEVER HAPPENED TO..." HERE). Not to worry. You will adjust to this. Just as the take-off of an airplane, at a speed of 100 to 150 miles an hour, seems really fast, but the cruising speed of 500 miles an hour at 35,000 feet seems like you're hardly moving, so too, will you get used to zipping through your life - without aging as you think of it - at warp speed, with a graceful calm and comfort. Here we go, folks! It's the end of the world as we knew it... and we are all gonna feel really fine! I've never witnessed anything quite like it, folks. Person after person - those I work with in my therapy practice, and other friends and family - day after day telling me how spaced out, tired and lost they've been feeling lately. "All I want to do is sleep... and I can never get enough sleep." "I can't find any enthusiasm or excitement about anything I'm doing... and I'm not doing anything." "I'm broke. No money or work is coming in... and by the way, I'm not actively looking for any work anyway." "What gives, PL? Is this my 2012? Is this The Wave?!" Well... yes... but take heart. The tide is coming back in, and with it another surge, though keep in mind, for many people in our collective right now, "high tide" and "surge" are not welcome words. As I've been writing and saying for a while, The Wave is having three effects on people, depending on various factors. If you've been hunkering down, holding on against change in your life, digging into 3D ideas and beliefs, like dualism and limitation, and holding onto emotions like fear - you're continuing on in a struggling, battling, crisis-ridden way of life, in which obstacles, barriers and adversaries continue to plague your daily existence. On the other hand, if your statement is that you don't want to make the shift to 4D yet, but you don't want to suffer here on Earth anymore either, you're leaving the planet altogether. As FPL readers may recall, I posted the statistic a few weeks ago that more people died last year in the U.S. than in any year since we've been keeping the statistic. Finally, if you're embracing the challenge of inner change, doing the self-work necessary to open your mental, emotional, physical and spiritual channels, stepping into what feels like "the unknown" and moving forward into 4D where you create your reality consciously in accordance with your highest excitement, you're most likely not "dying" or experiencing any "disasters." BUT... you are feeling spaced out, tired and lost, even though you are simultaneously feeling more like your true self than ever before. This is to be expected. Moving forward in our evolution in the way we are doing during this moment in time requires a level of "emptying out," of personal, internal "house cleaning," that is rare. This period is similar to the Black Plague of the 14th Century, a major Wave in itself, when 60% of the Earth's population left the planet in a matter of a few years, while the rest of humanity divided up and either hunkered down and held onto primitive, superstitious beliefs and old ways of living from the Dark Ages, or went on to begin The Renaissance and Age of Enlightenment. A perfect metaphor came to me recently from a friend describing the damage done to homes on Fire Island by the superstorms of last month. The houses that were built firmly on the sand, presenting solid walls to the ocean, were knocked over by the storm surge and for the most part destroyed. The Wave, literally, slammed right into them. 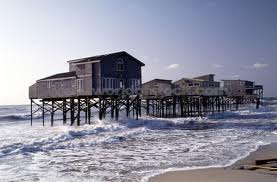 The houses that were built on "stilts," however, were spared from destruction because the surges of powerful waves moved through the open space. This is how it's working in all of our lives right now. Closed, walled up inner lives? Slam! Open, elevated consciousnesses? Whew! But listen everyone - we are all part of the collective of humanity. We are all one, all connected. So, this moment is exhausting for all of us, regardless of how you're receiving the changes. Over and over I keep receiving the message from "Higher Sources" that this is not a time for major outer action, not a time of "doing." It is a time for developing trust, faith in your Higher Self, in your path. As with every storm, you must wait until it passes before venturing out. I believe this is what the parable of Passover was about when that Wave of 1441 B.C. struck in Egypt. So, relax. If you have been doing the self-work necessary, you've built your beach house on stilts. As much as possible, rest, and do whatever gives you pleasure in the moment. There's this new ice cream out - "Jeni's" and their "Brown Butter Almond Brittle" flavor is an outstanding way to ride out the storm! Ugh! I know this is a hard one, folks. I know. Children are so close to our hearts as human beings, and so close to spirit as beings themselves. The images of those 20 kids being murdered so wantonly in their schoolroom is very, very hard for our 3D minds to wrap around, and even harder for our emotional bodies to tolerate without feeling overwhelmed. To understand that those children "volunteered" at the soul level to participate in this drama to further accelerate our transition to a new level of consciousness, that even the killer himself was a participant, doing a heinous job for that purpose, challenges us to greatly expand our understanding of the nature of the Universe that exists within us and around us. You cannot grasp the totality of this with a political, social or psychological perspective. This is not just about the need for gun control policies, saner institutions or better treatment of psychosis. This is an event that only a spiritual perspective can encompass and integrate fully. Only when you know that All That Is is all that is can you resonate to the message, to the purpose of something so painful, in the same way that only a spiritual understanding can understand any so-called tragedy or disaster. The fast track to higher consciousness, which is what we are on right now, requires an intense level of clearing and clarifying, of seeing ourselves for who we really are, of being ourselves as who we really are, and the first step towards that effort is seeing ourselves for who we no longer wish to be, who we really are not. We are not liberals or conservatives, Christians or Muslims, white or black, etc., etc. We are not even men or women, adults or children in the truest sense. We are all each other; we are all one and one with all. The illusion of separation coming to an end is very much what this great transition is about right now. The pain that we feel over the killings of the children in Sandy Hook is only possible because we are connected to our oneness with them. And yet, the solace that we can also feel is in that oneness, as well, because through that connection, we can know that no one, no thing, ever "dies," as in ceases to exist. No one ceases to be. Only form changes, and in fact is always changing, and always in the direction of even greater connection to All That Is. And as I've written here several times, everyone "makes it" back to Source. When I write about The Wave and the possibility of missing The Train to 4D, etc., it is not to imply that some will be left behind against their will, or left behind at all in any permanent way. It is meant to remind those who have decided to transition at this time that the time is here. The Wave, even when it appears in such a seemingly harsh form as a natural disaster or a man-made calamity, is here to help us accelerate to where we desire ultimately to go. We will see the children of Sandy Hook again. And they can see us now. They are scouts, path clearers for us, as many of us are for others. Being yourself as fully as possible is all that's required to realize this truth. Pursuing whatever brings you joy and allows unconditional love to flow through you is all that's required to live in a world that supports peace and harmony. And yes, yet, in order to clear the inner channels, we must experience grief. "One day, a wise teacher is with his disciples. The teacher's son has just died and he is overcome with grief. His disciples don't know what to think. For years, the teacher has been teaching them that life is an illusion, and yet, here they are faced with his grief at losing his son. Eventually one of them asks: 'Teacher, haven't you taught us that everything is an illusion? Why then do you grieve in this way for your son?' The teacher replies: 'It is true, everything here is an illusion, and the death of one's child is the most painful illusion of all." "Was sobbing in the bath yesterday and started channeling clear information: the grief releasing from my system is like using my breath when when I stretch my physical muscles (When I do this, I allow the breath and gravity to bring my body closer to the ground and as a result, the muscle stretches.). The channeled information said to use the tears like the breath, and release the tension from my psyche and subtle body. And to be careful not to attach the grief to the present, or I will miss the gift of the present. The part about "not attaching the grief to the present" is quite important. For many people working on themselves, The Wave is helping to bring up and flush out old sorrow and emotional pain that we've been carrying around for years, decades, even lifetimes, but it's easy to confuse this outpouring by thinking that maybe there's something "bad" happening in the present. Thank you for this personal revelation, K.
"ANONYMOUS" APPRECIATES THE WAVE INFO BECAUSE SHE'S TIRED! "THANK YOU PETER!!!! Perfectly timed!!! I keep forgetting when ask myself why the hell I am so exhausted in the midst of making more health conscious choices than ever...doing my personal work, exercise, love making, healthy food, vitamins, and fun? Why I have been dragging myself around for the past week feeling like I am 89 not 49? IT'S THE WAVE!!!! So glad to hear I am not alone." You are definitely not alone. This is a big one, and a big opportunity. Sounds like you're taking advantage of that opportunity, so... congratulations! And hang in there! "Laughter sheds light on every situation and every situation is love." I wondered in an FPL post a few weeks ago, "THE WAVE FOR OBAMA," whether The Wave was in fact coming to sweep Obama up for another term? Today, we know the answer clearly was yes. Barack Obama, rather resoundingly, has been re-elected for a second term as President of the United States. But in terms of my main focus on this blog over the last few years - The Great Transition (Pathwork Guide Lecture #75) of humanity to 4th dimensional consciousness - what does this event mean? "Now comes a third major phase on this path. The transition from self-centered isolation to the state of union with all is the most essential step on the evolutionary path of an individual spirit entity." As I've written on FPL, this current transitional time is a time of "non-optional choice." That might seem like an oxymoron, but let me explain. The non-optional part is that you must make a choice, now. In other words, this is not a time where remaining in neutral is possible. The status quo must go. The optional part is what choice you make. As has been written and talked about for a few thousand years, by soothsayers and metaphysically connected individuals, we collectively put in place a decision that in this age, at this time, and specifically centered around the calendar year, 2012, we would shift from 3D consciousness to 4D (You can read some FPL posts on 4D HERE). 1. You may hunker down, hold on, and dig into 3D ideas and beliefs - like dualism and limitation - which means that your life will be what is referred to in the Book of Revelations as the "Tribulation." In other words, you will continue on in a struggling, battling, crisis-ridden way of life, in which obstacles, barriers and adversaries continue to plague your daily existence. 2. You may simply leave the planet, making your statement that you don't want to make the shift to 4D yet, but you don't want to suffer either. As FPL readers may recall, I posted the statistic a few weeks ago that more people died last year in the U.S. than in any year since we've been keeping the statistic. Revelations calls this the "Rapture." Yep. It's definitely one popular route right now, especially with younger souls. 3. You may do the self-work necessary to open your mental, emotional, physical and spiritual channels, embrace change and the unknown and move forward into 4D where you create your reality consciously in accordance with your highest excitement. This is the "Thousand Year Golden Age" described in Revelations. I mean, this might seem like a no-brainer to you, but that most likely means you're on your way to doing whatever it takes to get on the 4D train. A good number of people right now, I can assure you, are going with options 1 or 2. So, back to the election of 2012 - what does it mean? What are we collectively choosing? Well, by re-electing one of the more mentally and emotionally balanced presidents we've had in decades in Barack Obama, it appears that we have decided to proceed forward without the most intense levels of a tribulation. In spite of those trying to paint him otherwise, Barack Obama is not an extreme figure politically, but rather a calm and confident "dog-whisperer"-type leader. He may not be particularly enlightened spiritually, not an "old soul," but rather, he is a "mature soul," and as such he can be a balance between the retrogressive and progressive forces in our country and in the world. Regarding the Rapture, I sense that it will continue in force, if not through war and geopolitical conflict, then perhaps through what we think of as natural disasters and illness, etc. But rest assured, if leaving the planet is not your inner choice, you will be here and you will be fine... or not! So, here we go, folks. There's now 6 weeks left to 2012, time to make your choice and get on the 4D train... or not. This particular moment "in time" represents the opening of a significant window in our continuum, a moment when there is a great deal of energy available to make the transition. 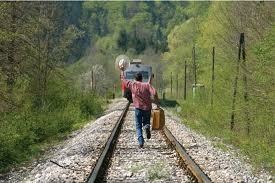 But the 2012 train is heading out of the station, and it will not be as "easy" to catch The Wave soon. Can you eventually catch another train? Absolutely. Ultimately, every being must evolve and continue to raise their vibrational frequencies on their way to fully conscious oneness. Everyone "makes it," in other words. But how and when is always up to us. Again, as I've said before, there will eventually be another train of acceleration to get on at some point, and sooner or later, everyone is going to 4D and beyond. But if you're ready, willing and able, now would be a good time to leap!